Screen time vs Chores: Happiness for all - Good Parent Inc. Despite what your children are telling you, less screen time and more time doing chores actually makes them happier. It’s true, more chores actually makes children happier. Responsibility helps to raise a child’s self esteem, and household chores help to build something called “grit” in children. Grit is the ability to perform a strenuous or difficult task without giving up. Although there is a working definition of grit, parents and educators have been largely confused by how to actually “build grit” in a child. How do we make kids gritter and more resilient? How can we help them to persistent when a task gets really tough and they want to quit? To answer these questions, researchers from Brown University School of Medicine, Brandeis University, and others surveyed nearly 50,000 US parents in all 50 states. Here’s what they discovered: Grit scores in children actually decreased as children’s screen times increased. In other words, the more time a child used screens, the more likely he or she was to quit a hard task. So what activity helped children increase grit scores? It was household chores. 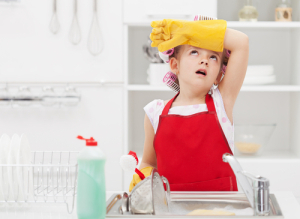 Children in the study who had more household chores, were more likely a child was to persistent in challenging or difficult tasks. These children were also happier. They score higher on scales relating to emotional well-being and happiness. When children in The Learning Habit research project had limited screen time and were given chores to do, they performed better academically, socially and emotionally. Household tasks, like laundry, cooking or taking out garbage, made children feel a sense of self-worth and responsibility. LEARN MORE: The Learning Habit is packed with hundreds of case studies and information from nearly 50,000 parents who participated in the groundbreaking research study. READ: “The Screen Time Rules You Really Should Enforce This Year” by Rebecca Adams on HuffPo Parents.